Vukotic is wanted for the killing of human rights leader Enver Hadri. MADRID, Spain (CNN) -- Spanish police say they have arrested a Serbian man wanted for murder who also allegedly once had documents incriminating former Yugoslav President Slobodan Milosevic in numerous assassinations. Veselin Vukotic, 47, was arrested over the weekend at Madrid's Barajas airport as he arrived on a flight from Paris, but the detention was not made public until Monday, police said. Vukotic has been a fugitive for 16 years, wanted by authorities for his alleged direct participation in the February 25, 1990 killing in Brussels of Enver Hadri, a Yugoslav human rights leader who was shot in the head. Vukotic was wanted by Belgian authorities for the Hadri murder, as well as by the United Nations war crimes tribunal in the Hague, Netherlands where Milosevic is currently on trial for genocide. Vukotic could be a key witness. Authorities said that in the past, Vukotic had documents incriminating Milosevic in numerous assassinations. But at the time of his arrest at the Madrid airport, Vukotic had only a forged Croatian passport and driver's license that listed his name as Ludvig Bulic. Spanish authorities, who had been tipped to his arrival from Paris, were not fooled, the police statement said. Investigators said Vukotic was possibly living with his wife and two daughters in Barcelona. 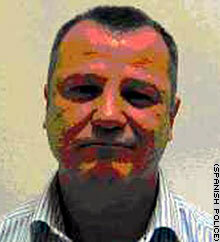 He has used a variety of aliases to get through border controls in Europe and Latin America, the police statement said. Investigators were still trying to determine the source of Vukotic's wealth, which have permitted him to live in "high style," staying at luxury hotels and constantly traveling, the police statement said. Three assailants, including Vukotic, were implicated in the 1990 shooting death of Hadri. The two other alleged gunmen were in turn killed separately, one in March 1990, shortly after slaying of the human rights leader, and the other in September 1995. Vukotic is also wanted for two fatal shootings in discotheques, one in March 1990 in Belgrade, and another in November 1997 in Prcanj, Montenegro the police statement said. Last December, Spanish police arrested a top war crimes suspect from the ex-Yugoslavia. He was Ante Gotovina, a former general in charge of Croatian troops in the early 1990s. Gotovina was arrested at a luxury hotel in Spain's Canary Islands.